How many times have you missed the best bits of a Marx Brothers movie, failing to catch Groucho's famous one-liners because you were still laughing at the bit with Harpo and the zipped-up banana? And what about the lemonade stall? The mirror section? And the blue-tinted ballet sequence? This book gives you what the videos can't, and that's a short cut to some of the funniest films of all time - Monkey Business (1931), Duck Soup (1933) and A Day at the Races (1937) - scripted by some of the wittiest screenwriters Hollywood ever produced. How many times have you missed the best bits of the Marx Brothers? This book gives what the videos can't - a short cut to some of the funniest films of all times - "Monkey Business" (1931), "Duck Soup" (1933) and "A Day at the Races" (1937). 5.0 out of 5 starsMarx Brothers. Always very funny, a good laugh on every page. These "screenplays" add nothing to the understanding of the film. The dialogue was taken from continuity notes, and then the author watched the film to create the descriptions. So we don't get to see what the Marx brothers and the crew had to work with, just what we see when we watch the film ourselves. Of course, when the original scripts can't be found anywhere anyway, perhaps transcribing is acceptable. The actual transcripts are fairly well written, and everything can be visualized from reading them. There is no real attempt to separate the scenes with location headings or to disguise the fact that it is a transcript. 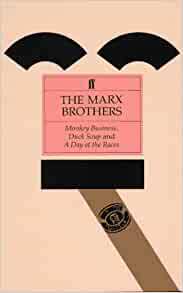 If you're a big Marx Brothers fan, and you can't live without them, then maybe get a copy for when the electricity goes out. But if you're looking for a screenplay, or for insight, look elsewhere. Just watching a Marx Brothers movie leaves some people feeling like they've been delightfully spun around until they are dizzy with laughter. There is so much that one can miss because they are too busy spitting out their drinks in a moment of surprise that they might miss a few moments of pure genius dialogue. When you read the screenplays you get all of it, every word, line and phrase...every sarcastic remark, every surealistic statement, every wise crack. And when you are done reading the screenplays, you are left in awe of what you had just experienced....pure comic perfection.